China is set to release a slew of economic data for the first quarter on April 17, including key reports on GDP growth, industrial production and fixed asset investment. An explosion at Malaysian Petronas' Refinery and Petrochemical Integrated Development, or RAPID, last week was expected to have a limited impact on sour crude prices in Asia this week. With Australian cargoes enduring drawn-out customs clearance times of up to one month in China, Colombian cargoes are becoming a sought-after option. The lowering of China's value-added tax to 13% from 16% from April 1 has renewed interest in the possibility of exporting petrochemicals out of China. A negative price spread between the FOB Korea and CFR China markers, and between CFR China and domestic prices, make exporting domestic material possible on paper. This week: China to release key economic indicators, and an explosion rocks a new refinery and petrochemical complex in Malaysia. But first, China is set to release a slew of economic data for the first quarter on April 17, including key reports on GDP growth, industrial production and fixed asset investment. Market participants will be closely watching the numbers to gage the pace of deceleration in the Chinese economy. The government last month set China's GDP growth target in the 6 to 6.5% range for 2019, lower than the 6.5% it set for 2018, implying the pace of commodities consumption growth this year will be slower. 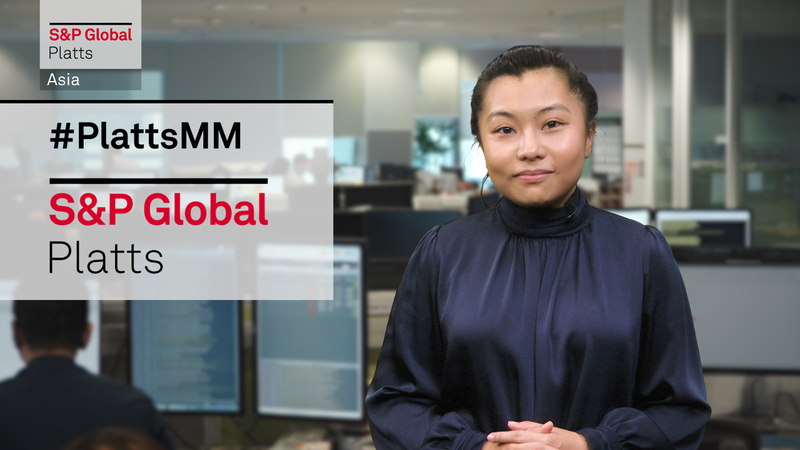 In plant news, an explosion at Malaysian Petronas' Refinery and Petrochemical Integrated Development, or RAPID, last week was expected to have a limited impact on sour crude prices in Asia this week. The refinery complex, a joint venture between Malaysia's Petronas and Saudi Aramco, had been expected to start exporting some refined products this month, and had secured most of its crude under term contracts, market sources said. The fire occurred at an Atmospheric Residue Desulphurization Unit, which removes sulfur from fuel oil and produces light to middle distillates. Some petrochemical market sources said the impending start of ethylene production at the complex could be delayed, impacting timelines for downstream products. In coal, between 1 million and 1.4 million metric tons of thermal coal is currently being loaded at Colombian ports for the long 60-day voyage to China and South Korea, according to market sources. With Australian cargoes enduring drawn-out customs clearance times of up to one month in China, Colombian cargoes are becoming a sought-after option, they said. Colombian cargoes currently also have a cheaper delivered price in China than Australian cargoes, at $65/mt CFR versus $68/mt, the sources said. In petrochemicals, the lowering of China's value-added tax to 13% from 16% from April 1 has renewed interest in the possibility of exporting petrochemicals out of China. FOB China sell ideas for benzene have already been seen, as tougher safety checks at downstream plants have limited domestic demand, while inventory levels remain high. With the start-up of mega-refineries in China, is an FOB China petrochemical market a possibility in the near future? Share your thoughts on Twitter with the hashtag PlattsMM. Finally, in agriculture, sources said that the Asian corn market looks set to remain bearish this week after the US Department of Agriculture raised its forecasts for higher ending stocks last week. Bumper crop forecasts in Brazil and Argentina continue to keep a lid on corn prices, while uncertainty over freight rates closer to the IMO 2020 sulfur cap on bunker fuel is putting a floor under CFR prices in Asia.